The semester is officially over and I finally have some time to get the other 78% of my life in order. Thus, I spent all afternoon on Sunday shopping, cleaning out my cupboards and organizing the fridge. My reward was being able to go into a clean kitchen yesterday and decide to make something…anything. Spring Masala felt like just the right thing. 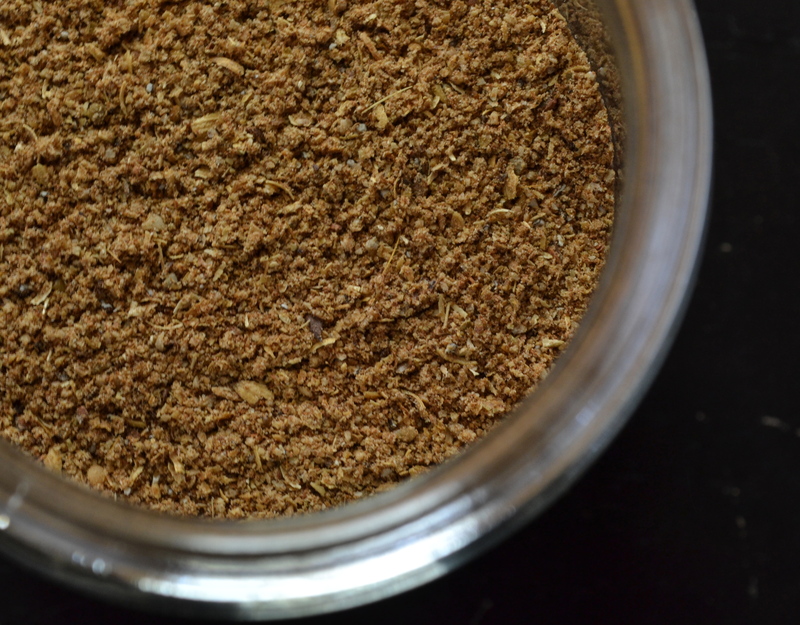 I learned, from my friend Emilie, how to make this masala about a year ago and it has become a staple in our house ever since. That is, it’s a staple in our well functioning house, which means we were all out of it after having just survived the end of my second year in graduate school. While this spice mixture is a great accompaniment to Indian lentil and rice dishes, and is even great mixed with black tea and a little sweetener for a chai-like concoction (believe it or not, that is one of my oldest son’s favorite drinks), I especially like this on oatmeal. So, as soon as I made this up I cooked a big pot of Irish oats. As I was cooking them my oldest, Noah, walked into the kitchen and saw the pot of oats simmering on the stove. He said, “Oh, are you cooking oatmeal?” “Yeah,” I said, “they’re Irish oats.” Probably wondering about the strange combination, he looked at me quizzically and asked, “Does that mean it has alcohol in it?” Hahahaha! No, I’ve never put alcohol in my oatmeal, and don’t plan to start now. You can use a spice/coffee grinder to make this, or you can do it my hand with a mortar and pestle. This recipe originates from The Path of Practice, which recommends that you grind everything by hand because of the holistic benefits derived from putting your work into the product. 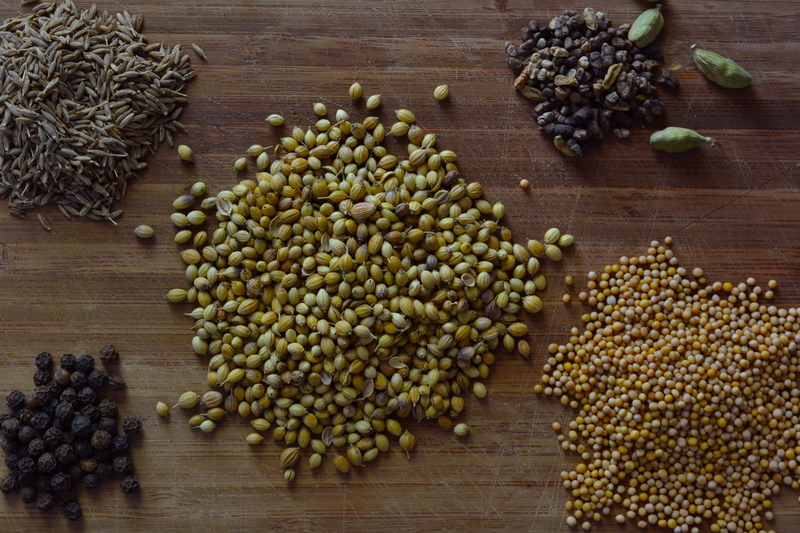 I put the large quantities, like the coriander, mustard seeds, and cumin in a coffee grinder, and did the smaller quantities by hand. I altered the original recipe by adding cinnamon to it, which I think is very good, but I can’t attest that it will still balance your chakras. Heat a small pan over low heat. 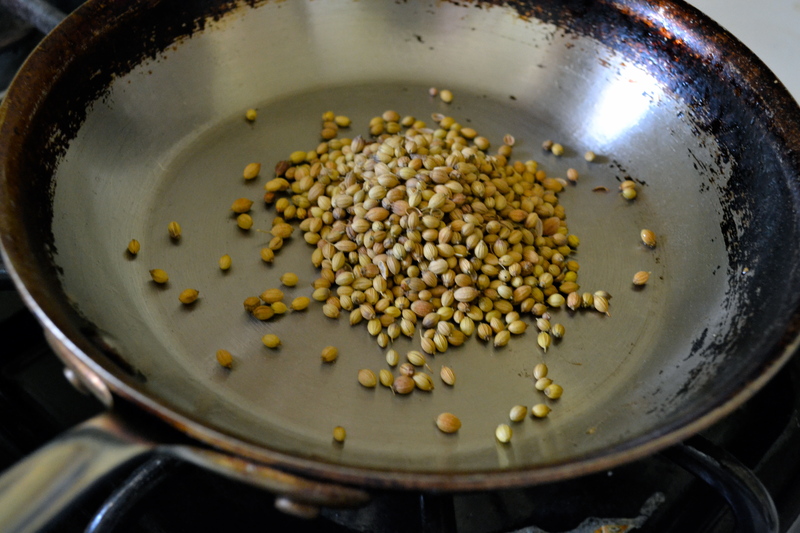 Once the pan is warm, add the seeds in batches, one kind at a time, and warm them up but don’t brown them. You’ll know they are ready when you can just start to smell them releasing their aroma, but before you can smell them toasting. Grind each batch of seeds while they are still warm, before you start warming the next kind of seed. Add the freshly ground cinnamon to the ground seeds and stir together. Store in a sealed container and use as often as you can as a seasoning with any bean or lentil dish, in Indian soups, in tea, or on your eggs or oatmeal. 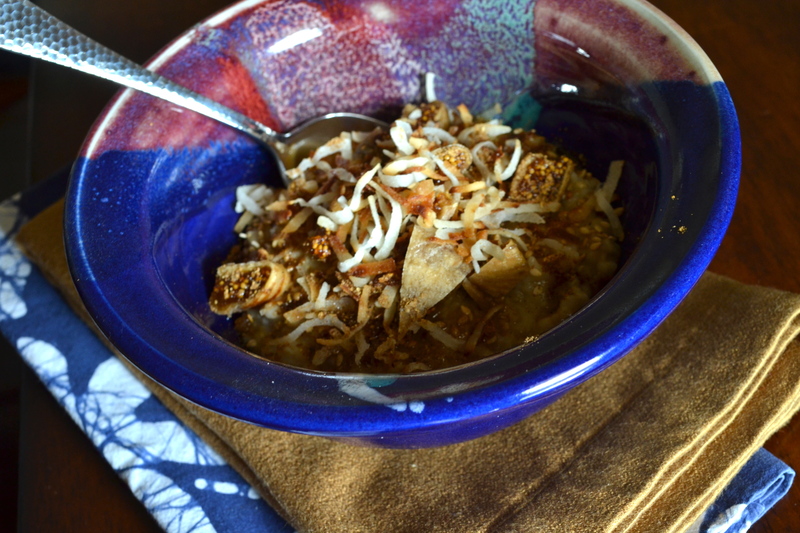 As I mentioned, my favorite way to use this masala is on my oatmeal. For a delicious East meets West breakfast, cook up some Irish oats and top an individual serving with 1/4 to 1/2 teaspoon of the spring masala, a tablespoon or two of raisins, chopped dates, or dried figs, some toasted coconut, and a little brown sugar. I like my oatmeal surrounded with a moat of hot soy milk. I love my mortar and pestle. 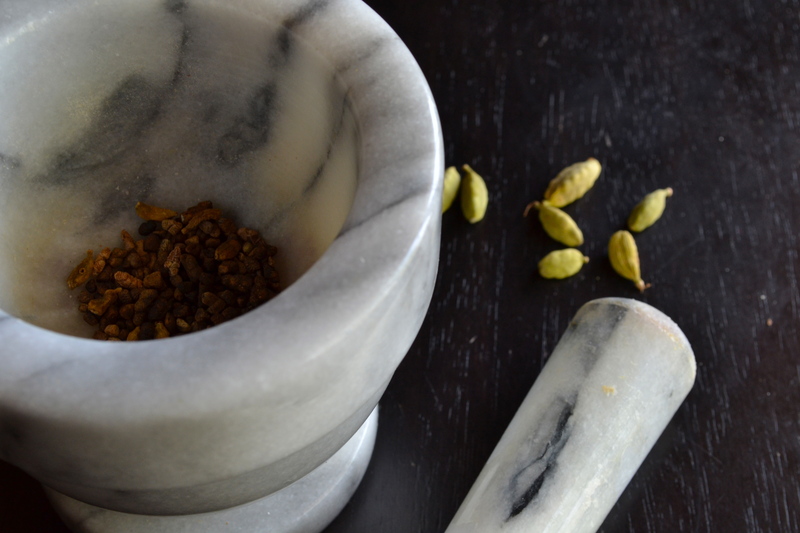 My friend has a ceramic mortar with groves in it and a wooden pestle that is really awesome, too. Glad you like the blog!